Dave Hogan, author of UFO FAQ, was recently interviewed by Howard Hughes host of The Unexplained. The Unexplained is a podcast that Hughes created to merge his hard news and broadcasting skills with his lifelong interest in paranormality,space and science. Listen to their discussion of Ufology below. This interview takes a closer look into the process Dave took in creating the book. This is the seventh book he’s written and he said it was the most difficult and time consuming. While most of his books only took him between 8 to 10 months to write, this book took 18 months. Although it was a longer process, that length of time shows just how in depth he went with the topic. He also noted that while this is a single volume, he could have gone further in creating an encyclopedia on the various topics. The topics he chose were a representation of similar stories. What is a UFO? Simply put, a flying object not immediately identifiable. Hughes starts the the discussion in the early 1900s continuing up until the modern UFO era post 1947. For those that may not have read the book and may not have a clue what Ufology is, this segment gives the first glimpse into the early sightings. Dave even shares the story of the 1937 broadcast of Orson Welles’s, War of the Worlds. Hughes continues the conversation entering World War II. Dave shares the story of the private aviator, Kenneth Arnold, and his 1947 sighting. There’s even a chapter in the book solely dedicated to Arnold titled, ‘Kenneth Arnold, the Eyewitness: He Saw What He Saw When He Saw It.’ Hogan cites Arnold and the crash at Roswell as gateways into the government interest of UFOs. The interview continues with snapshots of various chapters that detail stories of UFO sightings, including 1967 and 1973. The 1973 case was more in depth into how the aliens were interested in the human body and the topic of abductions. Hughes ties these findings into how Hollywood has depicted this information such as the movie, Mars Needs Women. What an amazing walk through of UFO FAQ bringing the text to life. Listeners not only learn about the process to creating a compendium as such, but gain a better understanding and detailed look into Ufology. Very well done and thorough. Today marks the 75th anniversary of the premiere of one of the world’s most beloved films – The Wizard of Oz – which took place at Grauman’s Chinese Theatre on August 15, 1939. Since its debut,this timeless MGM film has become a treasure to young and old alike. 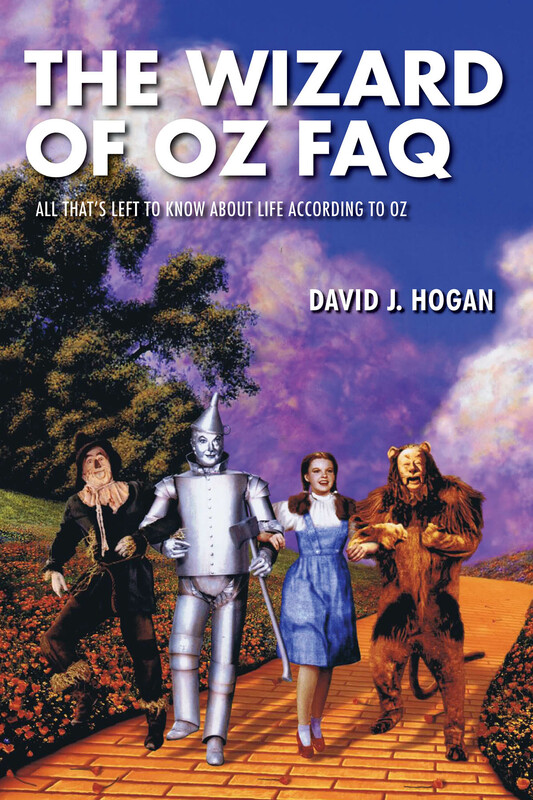 David J. Hogan’s new book, the Wizard of Oz FAQ, celebrates this classic by providing a wealth of information about the film’s conception, creation, and reception. David includes a special section commemorating the Hollywood premiere. Read below! The Hollywood premiere for industry insiders was mounted at 8:30 p.m. on Tuesday, August 15, 1939, at Grauman’s Chinese Theatre, prominently located on Hollywood Boulevard. The theater’s forecourt was dominated by a faux cornfield. Although Judy Garland was already in New York City for the August 17 Loew’s Capitol opening and her live show there, the Grauman’s event was attended by other cast members, Victor Fleming, and Mervyn LeRoy. Maud Gage Baum, widow of L. Frank Baum, attended, along with L. Frank Baum’s granddaughter, Frances Ozma Baum. Fred Stone, who had played the Scarecrow in the 1903 Broadway Wizard of Oz, also was an honored guest. Typical of any high-profile Hollywood premiere of the time, the Oz gala was attended by a gaggle of stars. Eddie Cantor, a great fan of the Oz stories, was on hand. Others were Wallace Beery, Ann Rutherford, Bonita Granville, Harold Lloyd, and Orson Welles (less than a year after his Mercury Theatre “War of the Worlds” radio broadcast scared the pants off America). Most of the Munchkin players had left Hollywood months before, but a few who remained were recruited to appear in costume at Grauman’s: Nona Cooper, Tommy Cottonaro, Billy Curtis, Jerry Maren (as the mayor, filling in for Charley Becker), and Victor Wetter. Most of the opening-night Munchkins remained for the duration of the Grauman run. The cost of reserved-seat admission to this gala event at one of the finest movie theaters in Los Angeles was two dollars, plus twenty cents for tax. (An admission ticket from the premiere—center left section, row 28, seat 1—sold at auction for $6,083 in the spring of 2013.) Those at the Grauman premiere received the requisite souvenir program. Fans could do star spotting from the relative comfort of five thousand specially erected sidewalk bleacher seats. The bleachers filled quickly, and the surrounding area was clogged by another three thousand fans that stood. The Wizard of Oz FAQ is a fact-filled celebration of the beloved 1939 fantasy masterpiece starring Judy Garland. It’s all here – from L. Frank Baum and his Oz novels to the complete background story of the movie’s conception, development, and shoot, with special attention given to the little-known parade of uncredited directors, casting difficulties, and on-set accidents and gaffes, as well as more than 75 sidebars devoted to key cast members, directors, and other behind-the-scenes personnel. You’ll find a wealth of fun facts: How MGM overworked Judy Garland before, during, and after Oz; why director Victor Fleming had his hands full with the Cowardly Lion and Dorothy’s other friends; what it was about Toto that really bothered Judy; the physical horrors of filming in Technicolor; the racial Oz gag that was scripted but never shot; when the Wicked Witch was going to be beautiful; why The Wizard of Oz owes a lot to silent-screen star Mary Pickford; the story of deleted scenes, and a full two weeks of shooting that had to be scrapped; why MGM star Mickey Rooney was part of the movie’s traveling publicity blitz; how the Wicked Witch was literally blown off her broomstick one day; the place where lions, tigers, and bears really do live together; singers you hear but never see; the day MGM fired Judy Garland; and much more. Just follow the yellow brick road! Happy birthday to Moe Howard! This incredibe Stooge remains forever a legend of the big screen and of the vaudeville scene. The extraordinary professionalism of the Three Stooges came from the boys’ long experience as song pluggers, backstage helpers, and comic performers in vaudeville, on Broadway, and in early sound cinema. 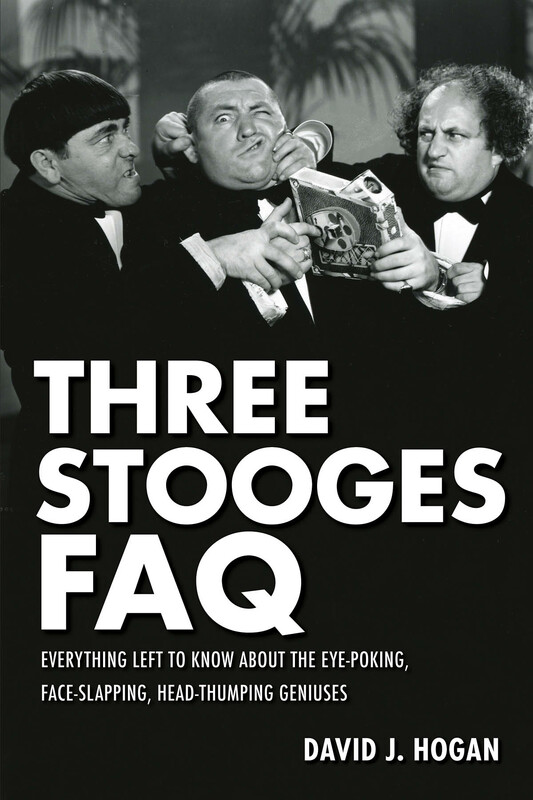 The following excerpt from Three Stooges FAQ delves into the grinding nature of showbiz during the era of the Three Stooges, and the business mentalities the performers had to adapt in order to achieve their timeless successes. Vaudeville theaters (many of which doubled as movie theaters) ran live acts much of the day and into the night. Top acts would headline, with lesser acts filling out the bill. Because of the theater’s long hours of operation, the venues were hungry for talent. Opportunity existed for the able, but most vaudevillians remained relatively obscure. Some topped the bills of came near to the top. A few made the transition to Broadway and to radio. And a very few stepped up to movies, gaining vast audiences. But even for featured acts, fame was relatively brief: who today recalls “International Juggling Humorist” Billy Rayes or the “Cantonese Capers” of Larry and Trudy Leung? Vaudeville performers who remain popular and fondly recalled today – such giants as Milton Berle, Abbott and Costello, Mickey Rooney, Bob Hope, Jack Benny, Buster Keaton, and the Three Stooges – are special and rare. While on the road, stars lived in hotels. Lesser lights made do with lesser hotels, or boardinghouses. It was showbiz, but it wasn’t glamorous. For all, it was a job, and for some, it was a grind. Most vaudevillians gulped greasy, inexpensive food, and had to contend with demanding theater managers, horny showgirls, abusive patrons, and acts that waited for moments to upstage rivals. The performers who prospered were the ones who loved their art. They didn’t love many aspects of “the life,” but they loved what they did on stage. Moe, Larry, Shemp, Curly, and Joe loved it, and developed district personas that jibed in intriguing ways with their real selves. Moe: an inherently serious performer with a sharp interest in the numbers side of the business, the group’s de facto leader, and the one who was prudent enough to end up with a gorgeous estate above Sunset Boulevard. On stage, he seemed comically boyish with his sugar-bowl haircut, yet he was startlingly pugnacious and impatient, quick to poke and slap those he considered rivals or inferiors. Larry: a habitué of racetracks who loved fine clothes as much as he loved the ponies. He and his wife were for many years residents of Hollywood’s highly regarded Hotel Knickerbocker. In performance, Larry was faintly absurd with his frizzed-out curls and blandly smiling face, but he was one of the most brilliantly “reactive” comics of the 20th century. He never purposely stole a scene, but he was always up to something amusing, even when physically situated in the background. Shemp: a famously funny Hollywood raconteur. Mickey Rooney told the fine historian Ted Okuda that whenever he spotted Shemp holding court in a restaurant, Rooney and his group invariably requested a table nearby, so they could listen in, and laugh. Although Shemp dealt professionally in a fast-talking worldliness, his real-life persona was kind and approachable. He was probably the most purely brilliant of all the Stooges, with a remarkable facility to think on his feet and ad-lib. Curly: the “baby” of the Howard brothers, an antic lover of life often described (rather too glibly) as a “man-child.” He was connected to family, and found his greatest pleasures in women, dogs, and automobiles. A fine dancer and a comic with astoundingly inventive physical skills, he influenced generations of comics that came later, from the great Lou Costello to Jim Carrey. Curly’s stage persona was apparently a reflection of his true personality, with hyper energy, boundless enthusiasm, and a lovable quality that friends, family, and his public found hugely endearing. Joe: like Shemp, he was impressively successful for years as a solo before he became a Stooge, working as a headliner in vaudeville and on Broadway. Stout and balding, he exploited his cherub’s face and body with cheerful cleverness. His carefully developed “sissy kid” persona slayed live audiences, and made him a refreshing addition to a latter-day incarnation of the Stooges. Today is the birthday of another Stooge – Curly. Below is some choice dialogue featured in the Three Stooges FAQ, by David J. Hogan. Just a minute! It’ll cost you two hundred for the privilege of digging it up! Oh, we’ll take it for nothin’! [to Moe] Can you think of anything else? No, you’ve covered it all! Look look look look! Those two men down there! They’re my uncles! This entertaining and informative study of the Three Stooges focuses on the nearly 190 two-reel short comedies the boys made at Columbia Pictures during the years 1934-59. Violent slapstick? Of course, but these comic gems are also peerlessly crafted and enthusiastically played by vaudeville veterans Moe, Larry, Curly, Shemp, and Joe – arguably the most popular and long-lived screen comics ever produced by Hollywood. Detailed production and critical coverage is provided for every short, plus information about each film’s place in the Stooges’ careers, in Hollywood genre filmmaking, and in the larger fabric of American culture. From Depression-era concerns to class warfare to World War II to the cold war to rock-and-roll – the Stooges reflected them all. Seventy-five stills, posters, and other images – many never before published in book form – bring colorful screen moments to life and help illuminate the special appeal of key shorts. Exclusive sections include a Stooges biographical and career timeline; a useful, colorful history of the structure and behind-the-camera personnel of the Columbia two-reel unit; and personality sidebars about more than 30 popular players who worked frequently with the Stooges. Also included is a filmography that covers all 190 shorts, plus a bibliography, making this the ultimate guide for all Three Stooges fans! Today is Larry Fine’s birthday. Below are a few facts about Larry and an excerpt from Three Stooges FAQ, by David J. Hogan. Enjoy! 2. Larry could play the violin and dance. He also worked as a song plugger, selling sheet music to vaudeville performers and others. 3. Larry wrote an autobiography, titled Stroke of Luck. “Larry is all about dogged determination after stepping on a control knob and bending the extender that connects the knob to the set’s tuner. He attempts to hammer the tube straight by holding it against a wall but only manages to create a shocking hole – and drop the knob inside the wall in the bargain. But he’s determined to retrieve this vital piece, so after a while the wall has been hammered so vigorously that it appears to have been ravaged by a crackbrained picturehanger. Larry can’t spot the knob, so he foolishly peers into one of the holes with a lighted match. Moe scolds him for inviting a fire and then carelessly tosses Larry’s match through the hole. The subsequent smoldering fire invites some good physical gags with a tiny fire extinguisher and a knotted garden hose that’s attached to the kitchen faucet. The bit climaxes when Moe furiously sticks the gushing hose down the front of Shemp’s pants. Shemp, like Larry, is in never-say-die mode and makes his way with the antenna to the roof of the house, where he batters the chimney into pieces (which conk Larry after he sticks his head from a window to see what the heck is going on), and later pounds a hole into the roof with such vigor that he plummets through the ceiling below. “I faw down!” he says apologetically. Today is Moe Howard’s birthday! Guest Blogger: David J. Hogan, author of Three Stooges FAQ , writes a little something in honor of the ornery Stooge with the bowl haircut. Enjoy! Study the swirls and eddies of history long enough, and you’ll uncover intriguing, often unexpected links between scientists, scientific discovery, and science’s practical applications. The history of science is very plastic, existing in a state of continual evolution, building upon its past to enliven the present and presage the future. Across the many centuries, obvious giants stand out: Archimedes and Copernicus. Isaac Newton and Charles Darwin. Thomas Edison and Stephen Hawking. Each of the real-life scientific accomplishments noted above occurred on June 19, Moe Howard’s birthday. Vectors of science and history, coming together! Happy 116th, Moe! The world can never repay you for your lifetime devotion to big science and, of course, big laffs. The following is an excerpt from Film Noir FAQ by David J. Hogan, as posted on Bookgasm. Visit Bookgasm to read this entire excerpt. One of the most highly regarded films noir, RKO’s The Narrow Margin (1952), came perilously close to oblivion after being completed. During thirteen days in May–June 1950, studio contract director Richard Fleischer shot the suspenseful story of a Chicago police detective who risks his life to transport a hoodlum’s wife to Los Angeles, via train, so that she can be a witness in a mob trial. 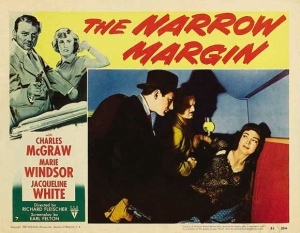 Most of The Narrow Margin is restricted to the train’s passenger cars, a marvelous construction of claustrophobic sets (by Albert S. D’Agostino and Jack Okey) with breakaway sections that allowed full camera access. The narrative is tense, and although many interludes are violent, the tale isn’t contrived. After the shoot was complete, RKO owner Howard Hughes suggested, with great enthusiasm, that the male protagonist, Detective Sergeant Walt Brown (Charles McGraw) leave his charge (Marie Windsor) in order to conduct a (literally) running gun battle with murderous mobsterson top of the train, as in innumerable westerns. Though cinematic, the added sequence would have removed the story from the realm of the plausible and turned it into a comic book adventure. Richard Fleischer thought it was one of the worst ideas he’d ever heard. Well, Hughes abandoned that notion. Then he came up with a bigger one. Because The Narrow Margin had turned out so well, Hughes wanted to scrap all footage with McGraw and Windsor. The editors would salvage as many other sequences as possible, and the leads would be recast with RKO’s two biggest assets, Robert Mitchum and Jane Russell. In a commercial sense, the idea wasn’t without merit, but it would obviously have meant the destruction of an exceptionally well-done B thriller. Fleischer, still typecast around the studio as a B-picture director, would probably have been cut out of the revamped project. He knew he could do Bs and ached to step up to the A-picture level. Hughes’s idea would be a setback to Fleischer’s career, particularly because rumors would spread that the McGraw-Windsor footage was deficient. Fortunately, the ceaseless activity of Howard Hughes’s mind brought with it some positive ramifications. Project ideas, endless memos with editorial revisions, a never-ending search for new starlets—all of that and more bubbled in his head like a stew. He eventually decided against—or simply forgot—the Mitchum-Russell idea, but time had passed. The Narrow Margin had been sitting on the shelf for nearly eighteen months. Film Noir FAQ celebrates and reappraises some 200 noir thrillers representing 20 years of Hollywood’s Golden Age. Noir pulls us close to brutal cops and scheming dames, desperate heist men and hardboiled private eyes, and the unlucky innocent citizens that get in their way. These are exciting movies with tough guys in trench coats and hot tomatoes in form-fitting gowns. The moon is a streetlamp and the narrow streets are prowled by squad cars and long black limousines. Lives are often small but people’s plans are big – sometimes too big. Robbery, murder, gambling; the gun and the fist; the grift and the con game; the hard kiss and the brutal brush-off.